Finally healthy again . Endlich wieder gesund! Hanna musste 7 Tage Antibiotika nehmen. Das hat sie sehr geschwaecht. Von Serviceorientiertheit und Untergebenheit was nichts mehr zu spueren. Ich war sehr frustriert. Das Problem war, dass es ihr so schlecht ging, dass ich sie nich dafur strafen konnte. Aber diese Zeit hat mich gelehrt, dass ich ohne FLR Beziehung nicht mehr leben koennte. Heute frueh endlich! Mir ist heute frueh im Badezimmer der Kajalstift heruntergefallen. Ich sagte Hanna sie soll ihn aufheben. Als sie auf allen vieren war, dachte ich, ENDLICH!!!. Da Bliebst die erstmal. Sie musste sich ganz lange dafur entschuldigen, dass sie in der letzten Zeit so faul war. Die faule Zeit ist nun vorbei. Hanna had to take antibiotics for 7 days. That has weakened her a lot. I noticed her lack of service orientation and sub demeanor. I was very frustrated. My problem was that she was feeling so tired that I could not really punish her. But that time has also taught me that I can not live without an FLR relationship. Finally, this morning! ... I lost my coal pencil in the bathroom. I told Hanna to pick it up. When she was on all fours, I thought, FINALLY !!!. "Stay there for a while" I said! She had to stay down there and apologize for a long time for being so lazy lately. The lazy time is over now!! O.K. ... apologies ... not very original .... and a day late to boot ... but there is a reason. Life has a habit of getting in the way sometimes. I am laid low with bronchitis. Friends had visited me from overseas for a long weekend of skiing (the snow is amazing this year). Unfortunately one of them showed up with a bad cough, which she said had followed the 'flu and had persisted now for two weeks. Great. With friends like that who needs enemies. Sure enough on the second night I was awake at 4am coughing violently with blocked sinuses and headache. To add to matters, the trip back home on Tuesday, which should have taken 4 hours, took 7 hours because of a motorway closure following an accident. It was 11PM when a very sick and exhausted Hanna arrived home. M had not gone skiing this weekend. She was very concerned for me as I travelled back, as she realized how sick I was. She stayed up late to help me unpack the car. So on Valentine's day I dragged myself out of the bed early to go to a doctor that M had contacted. Getting a doctor as a recent immigrant in Germany is no easy matter. I am not "on the books" of any local doctor and they are all full. Ageing population profile I suppose. Anyway, one doctor agreed to see me as an exception when M informed them that I had a fever (not strictly true, but I was running a high temperature). Antibiotics and a week off work were prescribed. Back home, I slept a good part of Valentine's day thereafter. When she got home, M made a big pot of delicious homemade soup for me, so that I don't have to cook during the days ahead. There is enough to last for a few days. Later she gave me lacy black underwear with a red bow as my Valentine's day present. She also gave me a padded bra (pictures to follow at some stage). This is the first time she has bought me a padded one. She could see I was shocked. She said simply, we have to "up things" a notch or two from time to time. She had me try it on. I had cleavage! 😲 "Wear the right sweater and people will not really notice", she said, "but you will be wearing it". Unlike the episode with the blue jacket, I simply thanked her this time. So on the health front, I feel a bit stronger today, despite still coughing a lot. I now have a very sore throat from the constant coughing though. The last time that I was a week off work, ill, was all of 25 years ago, so I can't complain. I have had a very good run, on the health front. 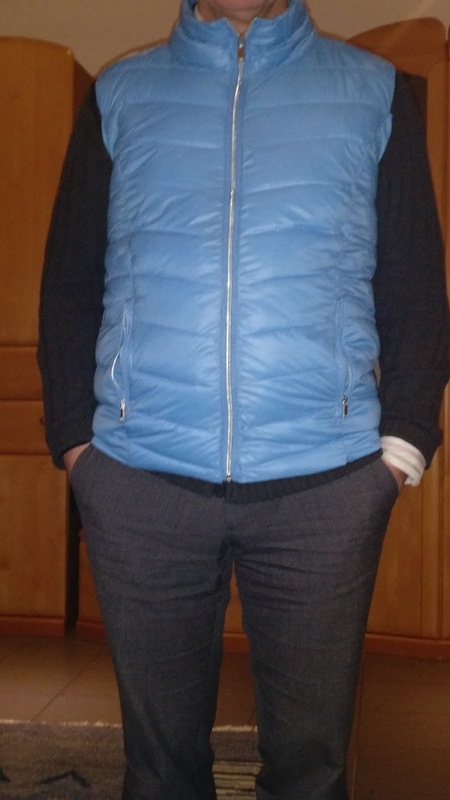 I was shopping for groceries today when I saw the same sleeveless jacket in light blue. The dark blues were gone. I thought "OK, Strafe muss sein". She will get a light blue now. So I bought the same jacket in light blue.She wore it and complained. Without a reason I think. It does not look more or less female than the darker one. I really think it suits her very well. She is a winter type and it suits her . Like every relationship, things don't always go smoothly. 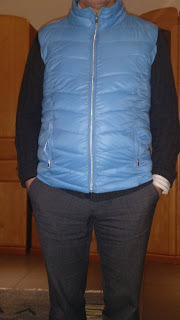 Having closed and published the last blog post, I continued to complain somewhat about the sleeveless jacket. "Right!" said M, "I have heard enough". Up she got , packed it away quickly in the original packing and said. "I'm bring it back tomorrow. You can buy one out of your own money." Now those of you who have read about our financial arrangements will realise that I have in fact very little money. A replacement will cost €15, quite an outlay for me. I immediately felt terrible, because I could see that she was very unhappy. I pleaded with her not to return it but she ended the conversation there and then and we went to bed as it was already late. Next day, I decided the only way to redress the situation was to buy the exact same jacket myself. However, there were none left in my size when I went to the shop. On the way home I bought a bunch of roses for M, to add to my apology. We were again skiing at the weekend. M is not a big skier but she comes sometimes to keep me company. The snow is amazing at the moment so it was great to ski Saturday and Sunday. The trip takes over 3 hours each way however, so it is a haul. On the return journey we drove for 100km in an absolute blizzard. At least this time I did not forget to pack anything important. Tonight M found a slightly different sleeveless jacket for me on Amazon. Slightly more expensive too, not that that is her problem. There will be no argument about this one. We both know it. I just have to swallow my pride.